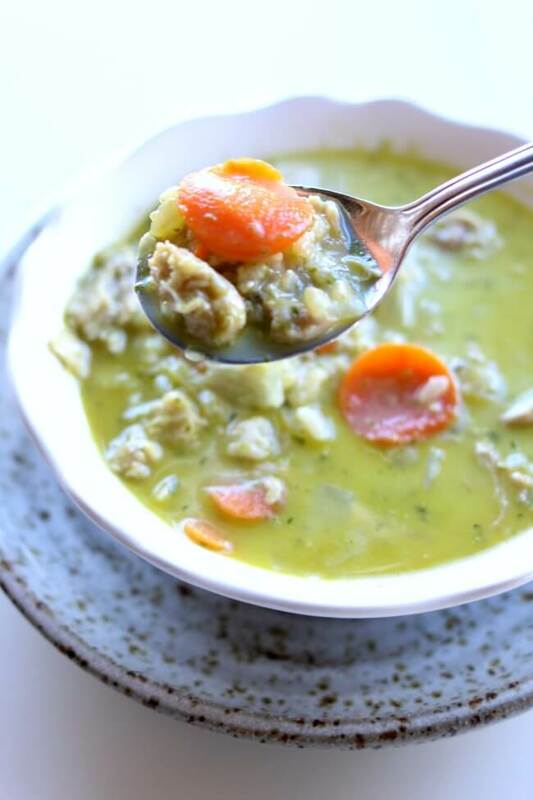 Instant Pot Pesto Chicken Rice Soup–a flavorful soup with tender bites of chicken, chewy brown rice and flavorful basil pesto made in minutes in your pressure cooker. 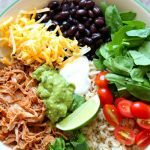 Today is Day 4 of 31 Days of Instant Pot recipes! If you’d like to receive all the recipes sent straight to your email you can sign up here. Today I made a healthy and delicious soup in the pressure cooker in a matter of minutes. 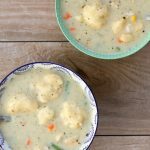 I couldn’t believe how quickly this soup was made considering it had frozen chicken and uncooked brown rice in it! 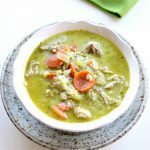 I love the slow cooker version of this pesto chicken rice soup so I felt I should give it a go in the Instant Pot. It was a great choice and my whole family was super happy with the results. 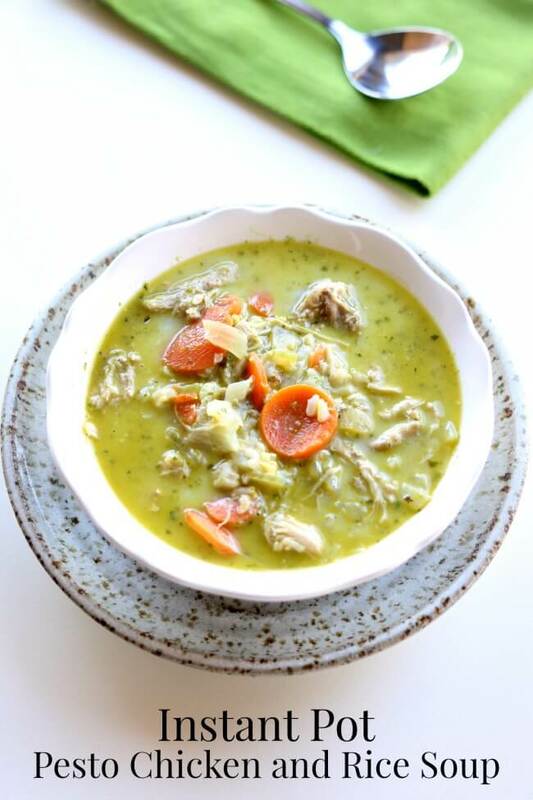 You’ll make this instant pot chicken pesto rice soup by piling chicken, broth, vegetables, rice and seasonings into your pressure cooker. 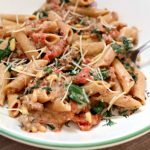 I like to use the saute function while I’m prepping and adding ingredients into the Instant Pot so that the pot can start warming up and it will cut down on the total cooking time. You’ll then set the cooking time to 22 minutes. My pot took 6 minutes to come to pressure, then it cooked for 22 minutes and then I let the pressure release for 10 minutes before I opened the pot. So total time in the pressure cooker was 38 minutes. Not bad at all! The rice was cooked to perfection and the chicken came out fork tender. You’ll then stir in some dairy and the pesto and serve it up! For these pressure cooker easy to peel hard boiled eggs I used this Instant Pot IP-LUX60 V3 Programmable Electric Pressure Cooker. It’s 6 quarts, so the same size as most slow cookers. It cost me around $80 on Amazon. 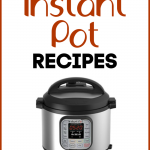 Turn Instant Pot to saute to warm up while you add ingredient to pot. Add broth, carrots, celery, onions, oregano, garlic powder, chicken and brown rice to the Instant Pot. Secure the lid and turn valve to sealing. Turn off the saute function, press manual and enter 22 minutes. Once the 22 minutes is up the pressure cooker will beep. Let it sit for 10 minutes. Then turn the valve to venting. Remove the lid and cut the chicken into bite size pieces, stir in warmed milk or half and half if you want it more creamy. Make sure that it’s warmed up or else the soup will curdle. Stir in the pesto. Ladle into bowl and serve. My IP took 6 minutes to come to pressure, 22 minutes to cook and then 10 minutes to release the pressure. Could I use almond milk for this instead of regular milk? Or maybe coconut milk in a can? I’m sure you could. It might affect the taste a bit but I bet it would be okay. 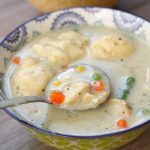 Do you chop the chicken into bite size pieces after the chicken is cooked? Yes, sorry for the confusion. I added that info into the recipe. Can I use a different rice, we like basmati! yes, but if it’s white basmati you won’t need to cook as long. Probably only 12 minutes cooking time. Hopefully the chicken will cook in that time. What kind of brown rice do you use? 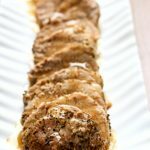 If I used thawed chicken breast, should I decrease the cooktime? If so, how much? Thanks! You could try it. I bet you’ll still need at least 18 minutes for the rice to cooker properly though. Thanks! I made it earlier and did 17 mins. I was worried the rice would be crunchy still, but it was perfect! Thanks for the great recipe! What is the brand/pattern name of the blue dishes in your photo?